Hair loss is a condition that affects millions of Americans - both men and women. Thinning hair and a receding hairline can drastically age a person’s appearance and leave them feeling far less confident. At True & Dorin Medical Group, our experienced doctors offer a number of hair loss treatments to restore fullness to the hairline. It is important to our doctors that we provide patients with effective hair loss treatments that also maintain the patient’s natural appearance. One thing that can interfere with the natural appearance of the hair and scalp is scars. While scarring is normal after hair transplant surgery, the experience of our surgeons, combined with the advanced techniques that we offer minimizes scarring after hair transplant surgery for our New York, NY patients. Our surgeons use advanced surgical techniques and precise surgical instruments to create the most discreet surgical incisions when performing hair transplant surgery. While this helps to minimize the appearance of surgical scars, it is unrealistic for patients to think that scarring can be avoided altogether. Any time that an incision is made, patients should expect some degree of scarring. 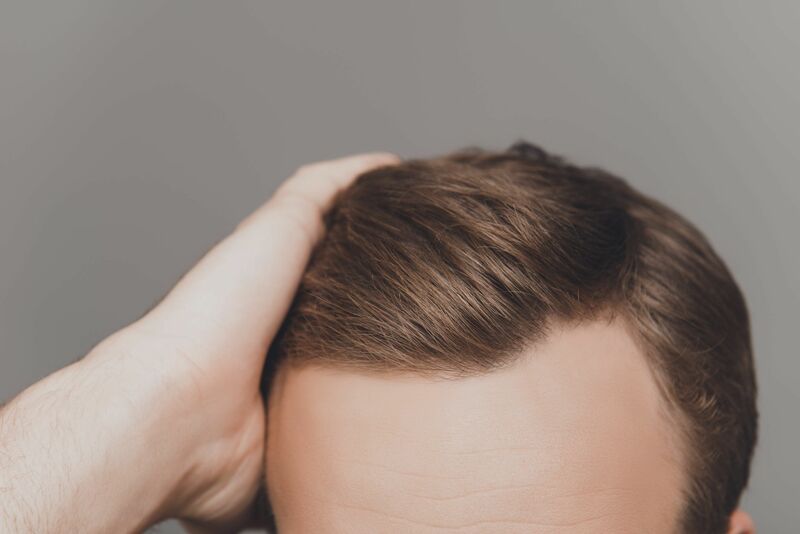 Depending on the type of hair transplant technique that is performed, patients can expect to be left with either a linear scar (in the case of a follicular unit transplantation), or dot-like scars (in the case of a follicular unit extraction). How Obvious Are Hair Transplant Scars? Although we advise patients to expect scarring after hair transplant surgery, the good news is that these scars are extremely discreet. Once the hair grows back in at the donor site, any remaining scar or scars will be hidden beneath the hair. However, even when that hair is lifted, most hair transplant scars are very difficult to detect. Even hairdressers have a hard time seeing a hair transplant scar. The circular scars left behind following a follicular unit extraction are particularly discreet. These scars often appear as white dots that are barely visible to the naked eye. Because of the low visibility of follicular unit extraction scars, this technique is ideal for any patient who is concerned about the appearance of hair transplant scars from a strip technique, or those who like to keep their hair cut short. Which Hair Transplant Technique Is Right for You? Our doctors are proud to offer follicular unit transplantation and follicular unit extraction. While scarring may be less obvious in patients undergoing the FUE procedure, each of these techniques offers its own unique benefits and drawbacks. Our doctors can discuss each of these procedures with you in further detail to help determine which is better suited to your unique needs and desires. If you are concerned with hair loss and would like to learn more about the hair loss treatments offered at True & Dorin Medical Group, we invite you to contact us at your earliest convenience. Our experienced hair loss surgeons can answer any questions you may have about hair transplant surgery, and the results you can expect from treatment.